UK, 1956, 105 minutes, Colour. Ingrid Bergman, Yul Brunner, Helen Hayes, Akim Tamiroff, Martita Hunt, Felix Aylmer. Anastasia raises interesting questions about the death of Czar Nicholas and Czarina Alexandra and their children. Women have claimed to be the Czar's daughter Anastasia, and several films have been made about such characters at the same time as this film a German version was made with Lilli Palmer in the central role. This film is quite literate entertainment and boasts excellent performances by Ingrid Bergman (who returned to Hollywood and won her second Oscar for this role), and by Yul Brynner and Helen Hayes. Some of the pageantry of the courts of Europe as well as the squalor of Europe are represented. But the central interest is in the strange character who is moulded into becoming Anastasia, the Czar's daughter. 1. Why was this an enjoyable film? The impact of history, the personalities involved, the fascination of fraud, the exercise of power? 2. What did the colour and wide screen contribute to the film and its mood? The costumes contrasting with the poverty? 3. The film was based on a stage play. Were the stage influences obvious in terms of structure, scenes and dialogue? Did this work to the disadvantage of the film? 4. What audience response did the film anticipate as regards Russians, the Czarist period, human sentiments, attitudes towards the Russian exiles? Did the audience share the hope for the real Anastasia to exist? Sharing the Empress' feeling? How did the film play on sentiment and feeling in the audience? 5. Why is fraud fascinating when it is explored on the screen? To what aspects of fantasy in the audience does it appeal? Gain and greed? Deception and power? Was the fraud well portrayed and did it involve audiences? 6. 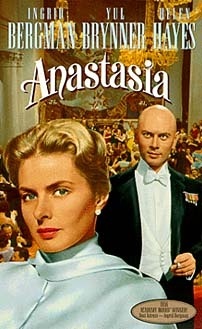 Audience response to Ingrid Bergman as Anastasia? Her charm as an actress? How convincing as an amnesiac? As responding to Bounine's power? Learning her role, her response to the others and to the fraud? How much did she understand? The crises for her that the suffering involved? How convincing was her gradual assuming the personality of Anastasia? Did she have any responsibility in the fraud? Paul's response to her? Her passing the tests? The attitudes of the sceptics? The response of the Empress? The impact of love for Bounine and its transforming Anastasia? 7. Did Ingrid Bergman deserve an Oscar for this performance? 8. The character of Bounine? Did the film make him credible? What were his aims? How shrewd was he? How much did he enjoy power over people? His power in the plot. How greedy for money was he? The importance of the support of his friends? Their role in the fraud? The response to the sceptics? How much was at stake for him? His behaviour during the test sequences and the reception by the Empress? Why did he disappear with Anastasia? 9. Comment on the picture of the exiles. 10. The importance of Prince Paul and his emotional response to Anastasia? 11. The influence of the Empress in the film - her refusal to see Anastasia, her expectations? How well did she suspect the truth? The importance of her advice to Anastasia? Her insight into her personality and emotions? 12. Was the ending satisfactory? On the human level? On the historical level?